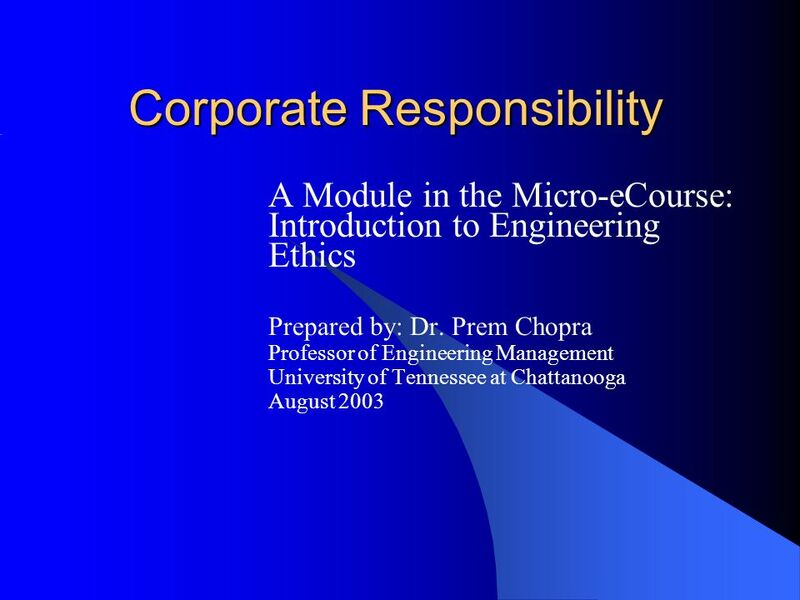 Corporate Responsibility A Module in the Micro-eCourse: Introduction to Engineering Ethics Prepared by: Dr. Prem Chopra Professor of Engineering Management. 8 References for this Module 1. 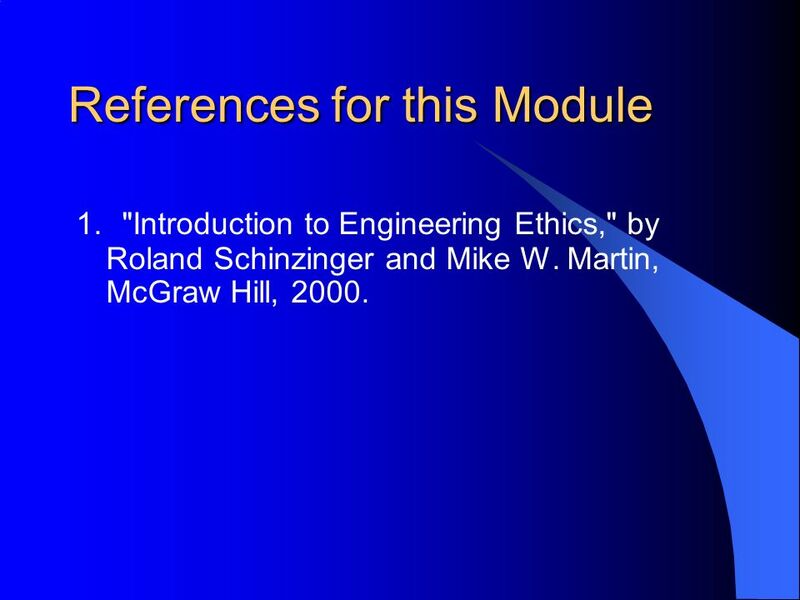 "Introduction to Engineering Ethics," by Roland Schinzinger and Mike W. Martin, McGraw Hill, 2000. 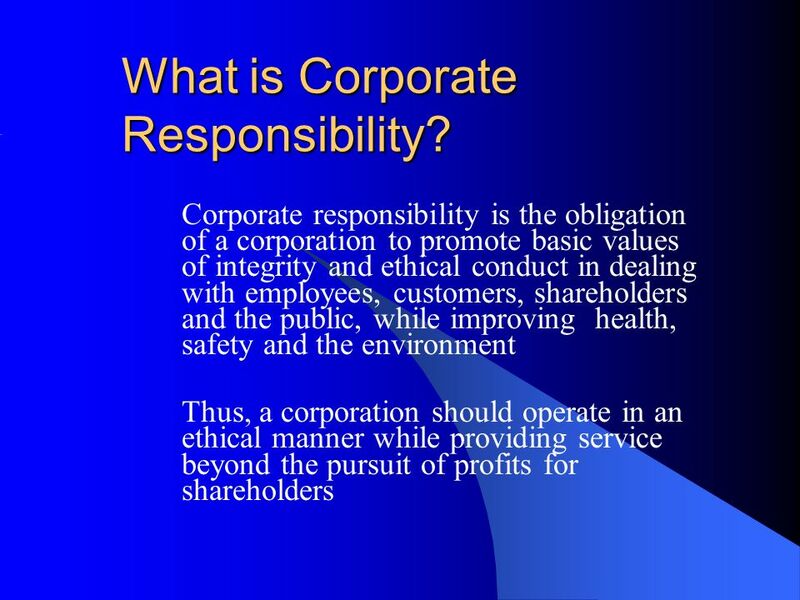 Download ppt "Corporate Responsibility A Module in the Micro-eCourse: Introduction to Engineering Ethics Prepared by: Dr. Prem Chopra Professor of Engineering Management." CORE VALUES As in our past, we are dedicated to the core values of Honor, Courage, and Commitment to build the foundation of trust and leadership upon. 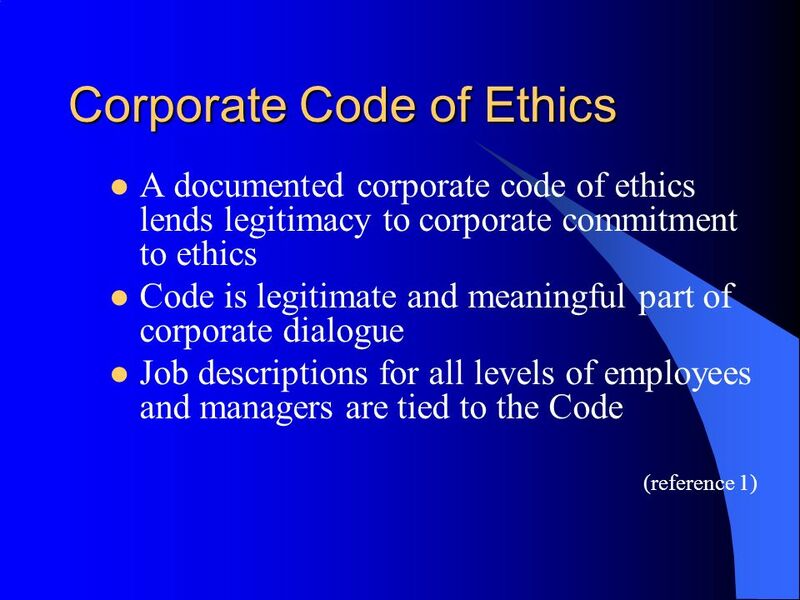 Introduction to Engineering Ethics – 2 Engineering Ethics Agenda Review Ethics I Introduce resources for ethical decisions in engineering References Challenger. CE August 2011 Last week: why you are studying ethics in this class – we want this to be the best 1 unit class you have at WSU fundamental canons. 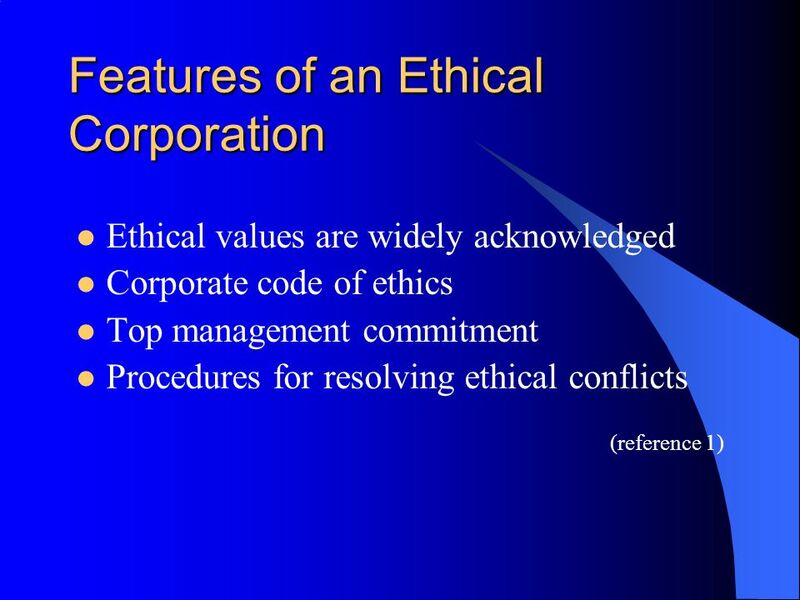 Introduction to Business, Business Ethics and Social ResponsibilitySlide 1 of 44 What Is Ethics? Ethics is the set of moral principles by which people. Presented by MUHAMMAD YAHYA AHMAD College of Education and Allied Program PCU, Manila. © 2013 Cengage Learning. All Rights Reserved. 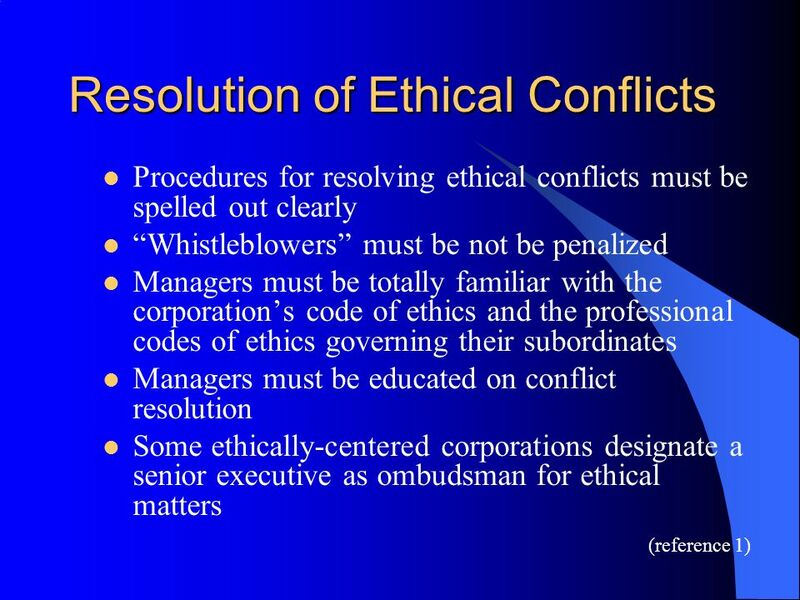 1 Part Three: The Decision Making Process Chapter 7: Organizational Factors: The Role of Ethical Culture. Chapter 10 Business Ethics and Organizational Performance. © IBE....doing business ethically makes for better business…. Business Ethics: the essential components Philippa Foster Back OBE Director Institute of. Ethics and social responsibility. WHAT IS ETHICS? 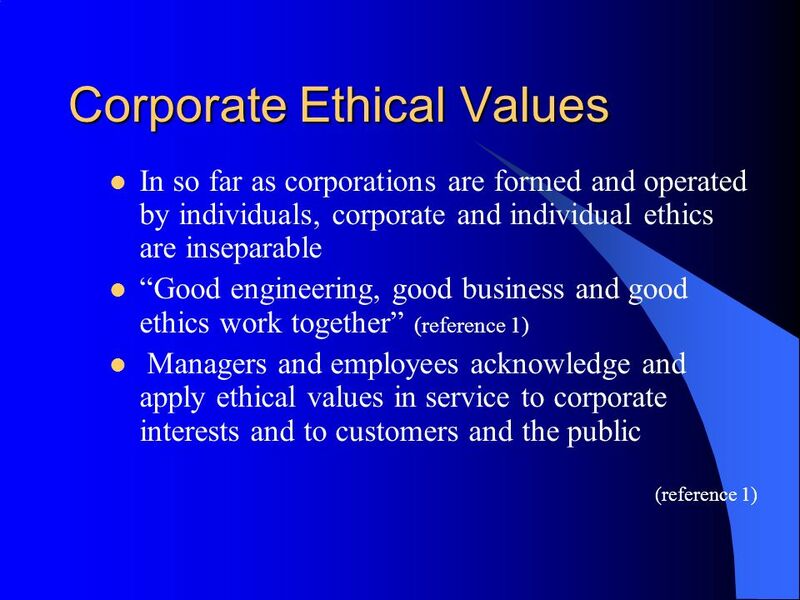  Take out a piece of paper, and take a moment to think about what ethics means to you.  On that piece. Minnesota Adoption of the Green Book April 16, 2015 Jo Kane Internal Control & Accountability Specialist.